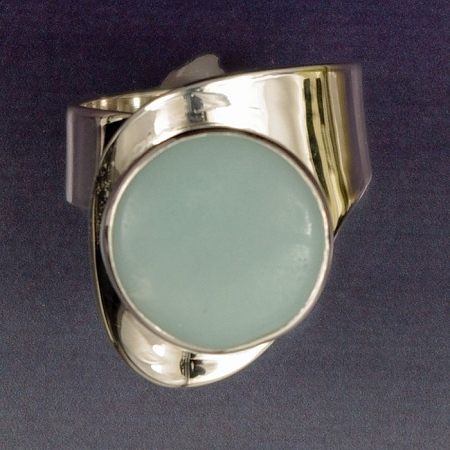 Modernist Jewelry - This is an original beautifully handcrafted sculptural sterling silver ring that features a round light blue Amazonite cabochon (28.4mm x 19.3mm). Shanks are adjustable for easy sizing, but can come soldered if preferred. Availability: Available Now Free Shipping. A sterling silver sculptural ring with a wide shank complementing a freeform Amazonite Cabochon. No issues with sizing as this ring is adjustable to fit any finger. and Modern Art Jewelry LLC, and is protected under U.S. and International copyright laws. without written permission from the artists. The digital images on our website are as accurate as possible. However, different monitors may cause colors to vary slightly. Copyright Modern Art Jewelry LLC. All Rights Reserved. eCommerce Software by 3dcart.